After talking to friends and employees, we realized that among some of the problems that affect everyday cruise passengers, is the long lines at places such as restaurants, or game rooms aboard. Because many people can congregate at one place a the same time, the traffic flow in the ship can become a hassle for many. Hence our idea of CruiseNav. CruiseNav helps the user find the best times to attend his favorite activities. From our interface, a passenger can see how busy is a particular place aboard and decide an alternative place based on availability. In an ideal scenario, being able to scout the lines at the restaurant would prompt other users to find these alternative places that are less busy, and therefore, help with the traffic flow aboard the ship. The app also comes with the possibility of implementing a rewards program, giving points to passengers based on how many events or places they visited during their trip. We ran into many problems during the development of the app. Using Cordova for the first time was not a simple task, and only the set up of our device took a long time. 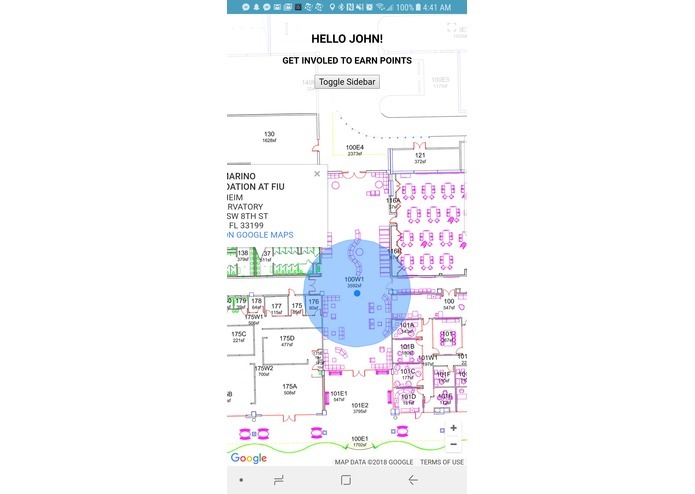 Using IndoorAtlas also proved to be quite a challenge, since we had to find floor plans for the building, map waypoints to increase accuracy, and implement the API together with Cordova. We are very proud of the fact that we successfully implemented the IndoorAtlas API, as it provided us with a very powerful tool for indoor mapping that we had never used before. Its application its highly scalable and we're excited to see how far we can push the technology. There are still many more features to be implemented in CruiseNav. We want to allow users to be able to check in at events with just simply being there and not worrying about anything else. Such feature would be implemented with NFC tags and a whole ecosystem dedicated to this task. We also want to give users the ability to have step by step directions to their desired place in the cruise, much like what Google Maps does in the land. We would also like to test this application in a real-world scenario, where we can see just how many people are at a certain place in real time and use machine learning to give recommendations about locations with similar purposes or locations that might interest the passenger.